Who doesn't love Jean-Pierre Jeunet? The Frenchman behind such beloved films as Amelie, The City of Lost Children, Delicatessen, A Very Long Engagement, Micmacs, and yes, Alien: Resurrection, is back at work on his next feature film. It's called The Young and Prodigious Spivet and is currently shooting in 3D right now up in Canada. The family film is based on The Selected Works of T.S. Spivet, with newcomer Kyle Catlett starring as T.S. 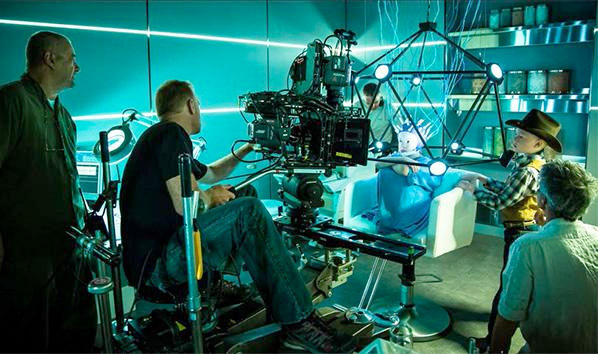 Spivet, and Creative Cow (via The Film Stage) has the first behind-the-scenes photos of the production in progress. It looks kinda wacky, but I wouldn't expect anything less from Jeunet. The Selected Works of T.S. Spivet is the debut novel by American author Reif Larsen. The book follows the exploits of a 12-year old mapmaker named T.S. Spivet, who lives on a ranch in Montana, as he receives a prestigious award and accepts it, hitch-hiking on a freight train for the acceptance speech in Washington D.C. Jeunet will shoot the film in 3D, and it's expected to "be a return to the vibrant world of Amelie." This is filming in English and stars Kyle Catlett, along with Niamh Wilson as his sister and Jakob Davies as his brother, plus Helena Bonham Carter, Judy Davis, Robert Maillet and Callum Keith Rennie. This looks like something quite unique from Jeunet yet again. We'll keep you updated on more details as they arrive. Will watch anything by that dude.